Polish rabbi and author; died in Lemberg 1722. He was the grandson of Moses Ḥarif the Elder and the father of Israel and Hirsch Ḥarif, the latter of whom became rabbi of Yaborow, Galicia. In 1684 he occupied the position of rabbi at Lemberg, where he remained till his death. He was one of the most influential members of the Council of Four Lands. His approbations, dated at the meeting of the council at Yaroslav in 1685, are found in the "Naḥalat Azriel" (1687), in the "Toledot Yiẓḥaḳ," and in the collection of responsa entitled" Bet Ya'aḳob" (1693). As author he is known by his responsa relating to the spelling of the names in documents of divorce, and by additions to the list of names in the book written on that subject by Solomon Luria. 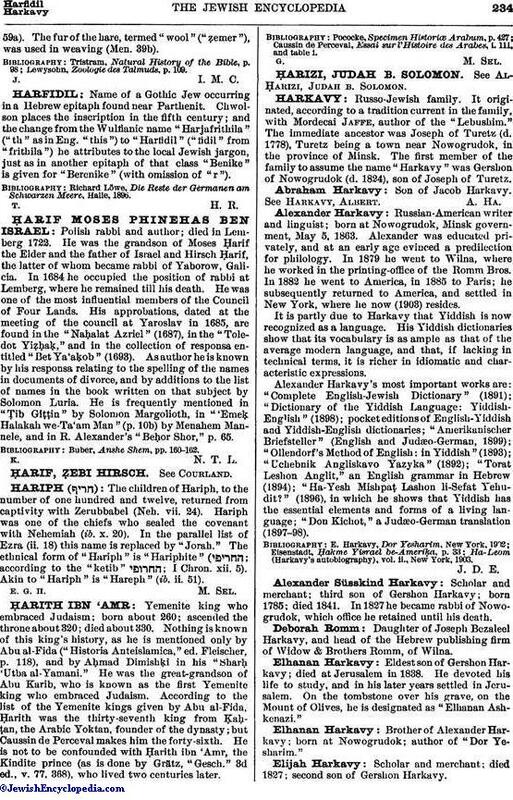 He is frequently mentioned in "Ṭib Giṭṭin" by Solomon Margolioth, in "'Emeḳ Halakah we-Ta'am Man" (p. 10b) by Menahem Mannele, and in R. Alexander's "Beḥor Shor," p. 65. Buber, Anshe Shem, pp. 160-162.